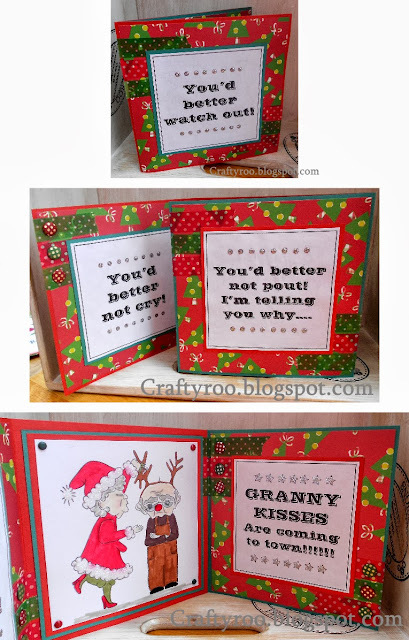 Crafty Roo Designs: Nina Crafts: Granny kisses are coming to town!!!!!! Nina Crafts: Granny kisses are coming to town!!!!!! I love this card I had such fun making it and every time I look at it it makes me smile! What more can you ask from a card? For this card I used the new stamp set from Nina Crafts Love and Marriage under the Mistletoe. To make this card I stamped and coloured in Love and Marriage under the Mistletoe. Next I cut two 14cm square cards one in red and the other in green and stuck them together to create a tri-fold card. Onto all the sides (except the back centre one) I added some pattern paper and some co-ordinating washi tape. Then I created the text and mounted these onto card leaving a slight border and one of them to each side (except the centre panel). Onto inside centre panel I attached the stamped image which had been matted and layered a few times. And to finished it off I added card candi, Glossy Accents and Stickles!!!!! !